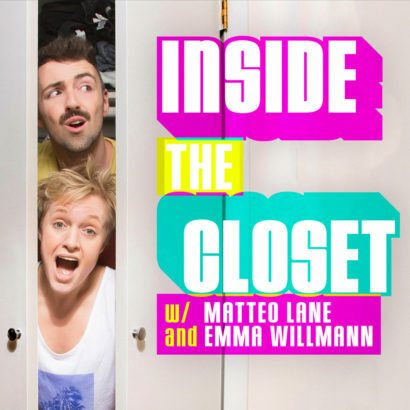 Inside the Closet is the brainchild of comics Emma Willmann and Matteo Lane. Their podcast acts as a window into their close friendship and the real conversations between comedians. Instead of discussing the industry, Inside the Closet offers a genuine and candid look at what goes on backstage at a comedy show. Emma Willmann appeared on The Comedy Lineup, Crazy Ex-Girlfriend, Crashing, The Late Show with Steven Colbert, and was featured in Time Out New York as one of the 10 funniest women in New York City. She also hosts The Check Spot on Serius Xm. Her material is “funny first,” meaning when she’s on stage she’ll talk about anything, no matter how personal or scary, as long as it gets her audience laughing. Matteo Lane grew up singing to birds in Chicago. Since then, he’s been on The Comedy Lineup, Late Night with Seth Meyers, The Late Show with Stephen Colbert, MTV, Logo, TruTV, and Comedy Central. He’s also the host of Ghost Hunt on Snapchat. He trained as an opera singer and oil painter in Italy before becoming a stand-up comedian. He does a mean Liza Minnelli impersonation, and has some harsh, but fair, advice for some of the gay community’s favorite divas.